For years the country has shown a strong political and social stability, supported by a consolidated democracy and strong legal certainty. Nowadays, the political system has three major parties which have taken turns in office, always keeping a strong respect for the rules of the game and the essentials of economic activity.This is regarded by investors as a distinguishing feature when it comes to choosing Uruguay as a mainstay for trust generation in business environment. By way of example, Uruguay ranks among the top countries in Latin America (and is well positioned in the world) according to the main rankings prepared by major institutions which gather information on aspects of political stability and democratic soundness. 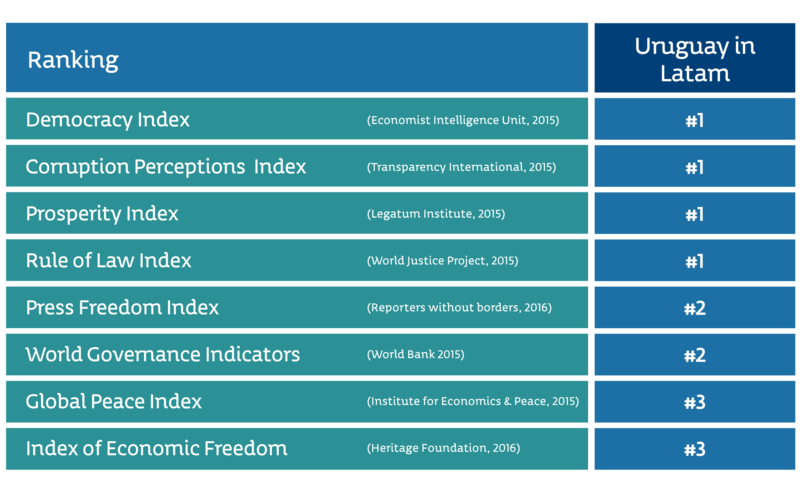 These indicators show that Uruguay is a country with a strong democratic tradition, based on transparent government policy and broad economic freedom. 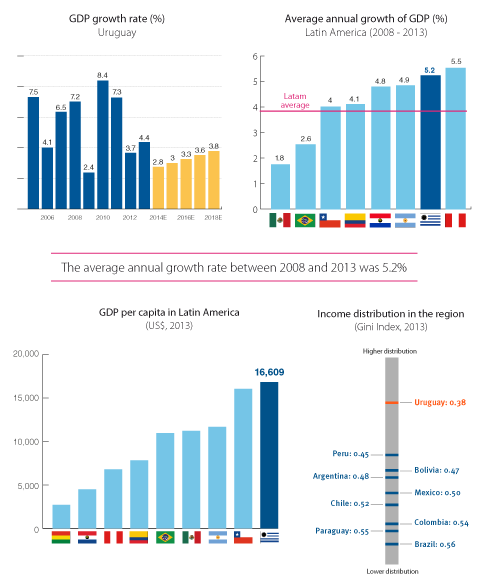 Uruguayan economy has achieved the longest period of growth in history, by accumulating 12 years of uninterrupted growth of its GDP - an annual average expansion of 5.4% between 2004 and 2014. This expansion was accompanied by a growth of the GDP per capita, which grew from US$ 10,000 in 2005 to almost US$ 17,000 in 2014. This has allowed Uruguay's economy to stand out as having the highest GDP per capita in Latin America (measured in current USD).